When you’re setting up a patient-care center or furnishing a loved one’s home with the necessary equipment to receive professional treatment in their own home, don’t settle for lower quality products just because they’ll be used for at-home care. It is possible to get facility-grade equipment at affordable prices, which is evident by examining the many features of the Invacare Reliant 450 patient lift from PHC Online. This professional-grade piece of equipment brings you everything you would expect from a hospital or nursing home and offers it to you for at-home use. With the option between two different models, the RPL450-1 and the RPL450-2, the Invacare Power Patient Lift provides you with ultimate flexibility when it comes to adjusting the base legs. The RPL450-1 design incorporates a padded spreader-bar handle, so the base legs can be manually adjusted and securely locked into an open or closed position. The RPL450-2 is slightly more advanced, because it uses a power-operated base to control the position of the base legs. 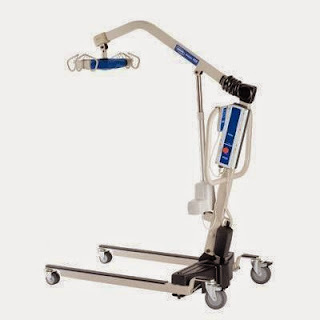 The base legs are motorized, so they can be operated with the easy-to-use hand pendant. The unique 6-point cradle design of the Invacare Power Patient Lift RPL450 gives you the ability to incorporate a variety of different sling types to maximize patients’ comfort and security. Choose from a range of sizes for several slings, such as the fully body mesh, the U-sling mesh, the full body padded and the U-sling padded slings. To effectively assist lifting and lowering patients to and from the widest variety of heights or positions, the Invacare Reliant 450 has an expansive lift range. The height range allows for lifting all the way from the floor to high surfaces as tall as a countertop or patient table. Plus, you and your patients can feel safe knowing this Invacare device has a manual emergency lowering device that instantly responds to power loss. Affordable and reliable, this Invacare patient lift is designed to provide maximum comfort for the patient and built to give caregivers an effective, easy-to-use tool.